Today, when we think of tie-dye, we automatically imagine the sixties and seventies with their peace movements, flower power and Woodstock. 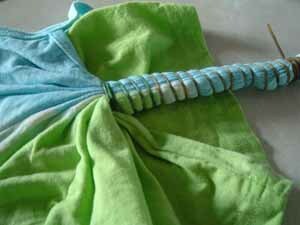 However, the art of dying fabrics and specifically tie-dying goes far back in time. Men has always had the urge to adorn him or herself. Nature is full of colors and very early on it was understood that those colors nature offered could be used to beautify the clothes one wore. China and Japan had fully developed the art of tie-dye as early as the sixth century AD, about one and a half millennia ago. Hemp and silk which are very receptive to dying had become available and made this outstanding art possible. Instead of dying the finished garment some tribes in Central America, South East Asia and Western China dyed the threads before weaving. Technically this was not tie-dye but the beauty of the designs that appeared was striking as were the patterns done with tie-dying. Today we are used to synthetic dyes that are easy to use because they are safe, long lasting and quick setting, but in the early days dyes had to be extracted from nature. Sources of these dyes were roots, berries and the flowers and leaves of a variety of plants like blackberries, safflower, marigold, sage, indigo and many others. 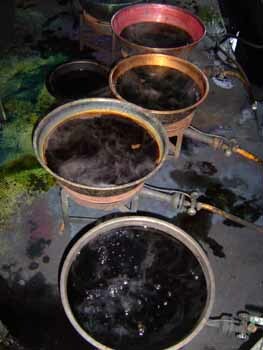 Some of these natural dyes are still used today. They are of very great interest to the artist who work in close proximity to nature and who promotes organic fabric and clothing. As a fiber used for the dyed clothing, natural materials offer themselves very prevalently as they take the dye much better than many synthetic fibers. During the Momoyama period, which lasted for about 30 years at the end of the 16th century, a new fiber-art form developed which combined tie-dye with ornamental drawing. This art form spanned the whole gamut from a piece consisting of mostly tie-dye on one end to large un-dyed areas for drawing flower, tree and landscape designs on the other end of the spectrum. In Japan this form was used to create kimonos awarded to officers by the warlords in recognition of special bravery in battle with neighboring adversaries. These kimonos were a very valuable family possession and have often been passed down from generation to generation. Today many of those art pieces can be found in museums. The natural dyes might have faded but the depicted designs are still magnificent. It is interesting to notice that a few centuries later tie-dye became the symbol of non-conflict, understanding and peace. This generation of baby boomers is now in a position where it has time to reflect after their most productive time in life, and we notice a growing interest and a revival of tie-dye. 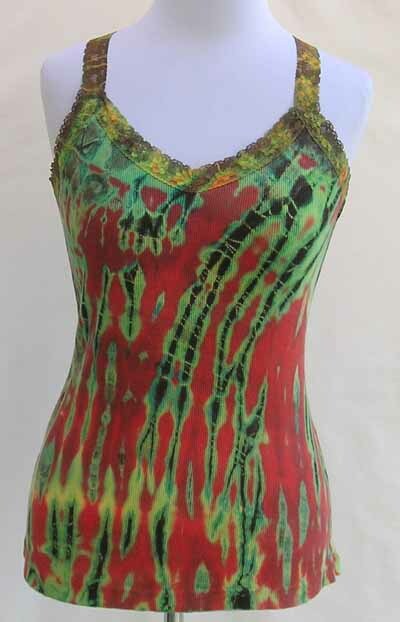 Often today’s tie-dye pieces are of much higher art value than the sixties Woodstock t-shirts and in particular when combined with the traditional Asian Mudmee tie-dye, garments become wearable art. Many of us will have noticed that there pronounced cycles in fashion. The most obvious is, in my opinion, the skirt’s hemline. The reason for a repetition here is obvious because there are only so many length variations. It can be all the way to the floor, half calf, below the knee, just to the knee and above it. Then a few inches above the knee, half thigh and then all the way where the skirt hardly deserves its name any more. The hem has to go somewhere and that is pretty much the range, so there must be repetition. Sometime int he past that range was much small and from my own personal experience know what an uproar the expansion of these limits created when the hem dared to rise above the knee, way above the knee. I was still very little, but you can imagine if I can remember the uproar, as a kid where I certainly did not follow any fashion trends. But now the whole leg is discovered, the range is maximized. I just realized that actually these mini skirts were not all new. Think back to the Roman Empire. OK, it were not women, but these soldiers did wear these cute little mini skirts. Now, hem-line is one variable, but there are many more. For one there is the prevalent color scheme, pant legs – straight, bell-shaped, low waist, high waist. Then shoulder width, narrow waist or loose. Taking all these factors into account there should be enough combinations that there should be no repetition for a long time. Maybe it’s the same principle as browsing through the closet once in a while – sometimes you discover something you totally forgot, but when you see it, good old memories come back, you pull it out and wear it. I could imagine that this is the same with fashion designers and trend setters. There are just some things that make us feel good, and we want to regain that feeling when we remember it. If we just pull out an old outfit to get this old feeling back we often combine this with some of the new experiences we had in the meantime. This way the old becomes new and fresh again. If we accept the idea that bringing out old trends and outfits re-creates the emotions of the time past, we can understand the endurance of tie-dye. Its first big epoch were the revolting 60s and 70s; definitely a time of full experience of life, the feeling of freedom and accomplishments. There are now some new designs beside the all-prevalent big spiral on the chest, but it is getting a bit dated, and usually, if you see someone wearing the typical tie-dye shirt, you get the feeling of not quite in present time. This is why the new fresh tie-dye from JustZen.com is such a big success. Nothing realy new was invented, just a creative combination of the traditional mudme, prevalent in the bigger area of Thailand and Laos, with the tie-dye of the hippie days. A very interesting facet of this combination is the addition of subdued color ways. 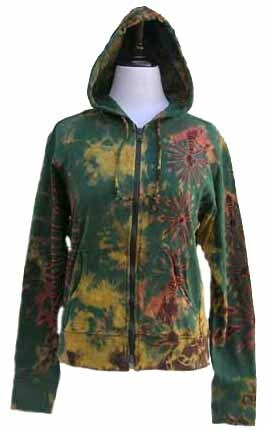 Or have you ever seen such a quiet, warm tie-dye jacket as the one accompanying this article? 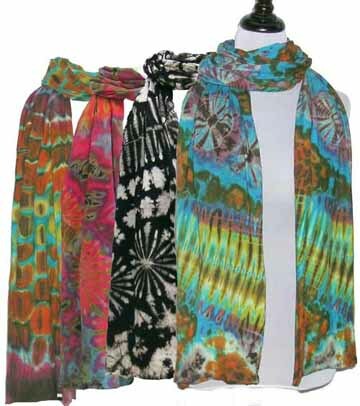 Since I got involved so deeply into clothing and fashion through our tie-dye business I am always on the look-out for good sites that can give me a concentrated collection of sites where I can find what I am looking for. In response to our last newsletter some of you told us that you enjoyed the report about Gigi’s Thailand trip and that you wanted to hear more about it. Obviously the big news was, as reported previously, that Gigi got to do an internship with the owner of our studio in Bangkok, Thailand, who is one of the very few people in the world with this great mastery of the traditional Mudmee tie-dye art. Gigi had left Thailand many years ago to live in the US and now she had to re-learn what citizens of Bangkok have to do most every day – battling traffic. Since Gigi had left, Bangkok has expanded immensely. The increase in car traffic had brought it nearly to a stand-still. Often traffic is just grid-locked and you get faster from one place to another by walking. But Thais are creative and inventive and solutions on different levels have been implemented to get a grip on the situation. On the private level are the operators of motor cycle taxis! Unimaginable for us here in the US, but a viable means of getting around cheaply in Bangkok. One of the city-wide solutions for the traffic grid-lock has been the construction of the Sky-Train lines. These are (often elevated) city trains that quickly connect main points of the city, a very big city with estimates of size range from 7 to 20 million people. When Gigi had to learn to commute to her internship, she had to employ several of the new means of transportation. Taking a normal taxi or private car would have just taken too long. So, leaving the house of her friend, where she lived during her stay in Bangkok, she had to walk only a short distance until she could flag down one of the motor cycle taxis. The very low fare bought her a seat on the back and a short and sometimes scary ride to the next sky train station. After that it was half an hour on the train and then another ride with either a regular cab or another motor cycle taxi. You can clearly see how tightly rubber bands are used to create resistant areas in the garment. When the whole piece is prepared like this – and HOW it is prepared that is the artistry – then it’s time for the bath in the dye. You can see here that each of the baths has it own burner with a gas supply line to keep the dyes at the required temperature. OK, this was another interruption of your busy day and now we let you get back to your other activities. Christmas is approaching in giant step now and if you still need that one special present fo a friend, loved one – or yourself, there is still time (although little) to get something from JustZen.com as we are shipping the same day by priority mail. 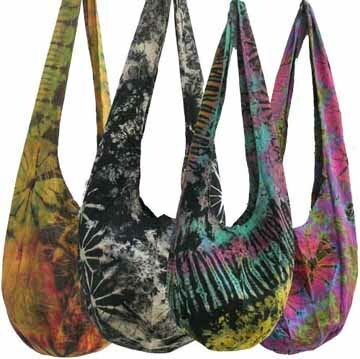 Our tie-dye bags make great presents as do the cotton jersey tie-dye scarves. We are glad that you stayed with us to the very end of this letter and will see you at the tie-dye website www.JustZen.com. PS: Right after Christmas we are planning to set up a little show-case, you sending us pictures wearing out tie-dye pieces with the chance to win a free hoodie – would you be interested, please let us know. Send us an email or leave a comment – thanks! The time before the holidays is always very busy for us at JustZen.com. But who isn’t busy, right, getting everything ready? In addition to the usual hectic this time we send our very own Gigi back to Thailand in order to get more ideas for some really unique tie-dye items for you for the holidays. And not only did she come back with great ideas for scarves and bags, we will tell you about later, but she also gained some incredible knowledge. We might have mentioned that the studio in Thailand, where Gigi was first exposed the mudmee tie-dye, kept their process very confidential. No spies were allowed in the studio to witness the process of creating these traditional mudmee designs. Gigi and the owner had become friends and so Gigi was allowed to learn the basics of mudmee tie-dye. So, yes, this was the one big surprise that we did not expect in any form or fashion (pun intended). But equipped with all this new skill we will now be able to bring even better mudmee tie-dye. OK, this was a little bit of an interruption of your day and I’m glad you stayed with me to the end of this post but now we let you get back to your other activities – we are certainly grateful that you took the time to read our news letter and will see you at the tie-dye website www.JustZen.com. This is just something I can not pass up – Eco-Aware at the 2008 New York Spring Fashionweek! I would have expected something more in the area of natural fibers and recycled cloths but to just leave out a bigger part of the cloths in order to protect the environment? Or is this supposed to be a hint that global warming is now really coming and we better protect the environment by not producing all that clothing that we will not need anyways? OK – I guess it’s just the attempt to ride on a fashionable term – after all – it’s fashion week. Sometimes on your journeys through the labyrinth of the internet you encounter a place that invites you to linger and look. And you accept this invitation and take more than one look. One such place is Eclectic Threads, a place to go if you are looking for very unique custom clothing. The summer is still upon us, and so it is not really time to think about holiday shopping, but if you are like me then you are always for the look out for that specific little present for a special person – independent of the time of year I must say. It can be hard to wait for Christmas if you have found that one thing already in summer because you are burning with anticipation to give. So why not give it right now – you don’t really need to wait for the holidays. Now the question, where do you usually find those very special gifts? Probably not in one of the big department stores. It’s these little specialty stores where you can stumble over that little Chinese porcelain pot that’s missing in Hanna’s collection of that totally right lace tank for Emily. Getting to these little specialty stores can require a lot of foot work, but fortunately with the internet many of those specialty stores are coming to you now, and you can save the soles of your shoes and do the foot work in your slippers. Here I am now at the subject I wanted to arrive at as you probably guessed – after all this is the companion bLog for that specialty website that brings you the most unique tie –dye you will find in all the lands – JustZen.com. It is true that large retailers are a great place to shop for holiday gifts. Particularly as the holidays close in, they do tend to run sweeping sales. Plus, they have a huge selection. You have the comfort of buying — or at least browsing for — many gifts in one location. But if you desire to relieve the stress of pre-holiday shopping I can only recommend to start as early as nobody else and if this one special person has any interest in unique clothing I must say you have definitely found one of those places where you can find solutions for your shopping list. Let’s look at gift giving once more from a bit different perspective. You don’t really have to wait for the holidays, a ‘just so’ present is probably much more appreciated that one expected during the holiday. 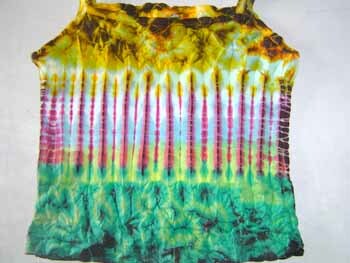 Right now with the summer in full swing why not get one of those beautiful tie-dye tank tops for the warm days. 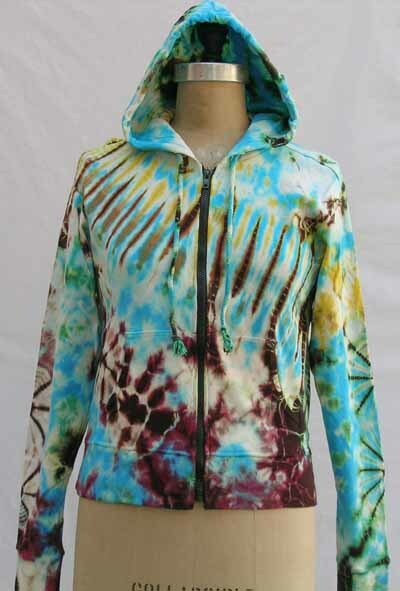 And if you really want to wait for the colder time of year you can get that tie-dye hooded jacket with built-in admiration now and keep it for the holidays – if you are able to stand the anticipation of giving so long. A friend who had bought some jackets from JustZen.com in the very early days of its existence, recently complained that our site is way too demure and we should pep that up a few notches. … and I have to admit, that this is a bit less demure, don’t you agree? So we kindly accepted his suggestion and contribution and added this image to our site – you think that is a good idea?